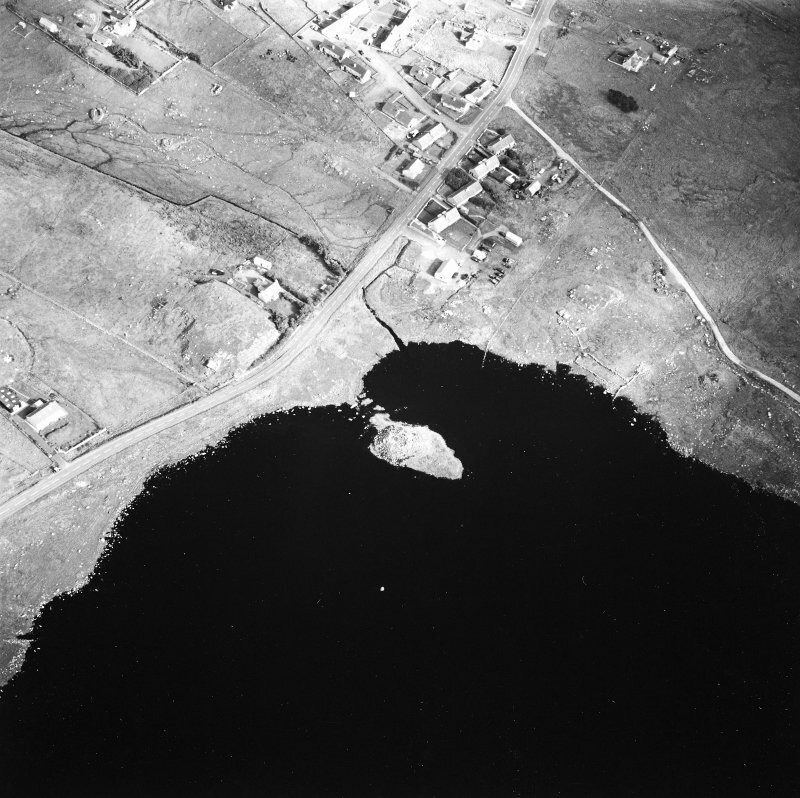 Oblique aerial view centred on remains of the broch with the possible crannog adjacent, taken from the SW.
Oblique aerial view centred on remains of the horizontal mills with the remains of the corn-drying kiln, broch and possible crannog adjacent, taken from the N.
Oblique aerial view of the broch in Loch an Duna, taken from the ESE. 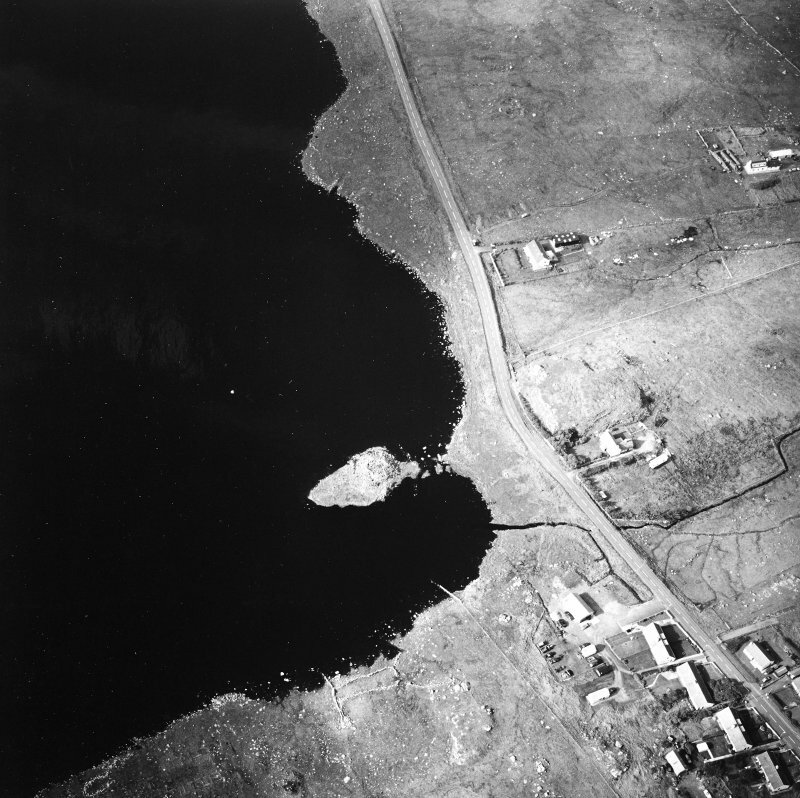 General oblique aerial view of Bragar with Loch an Duna adjacent, taken from the WSW. 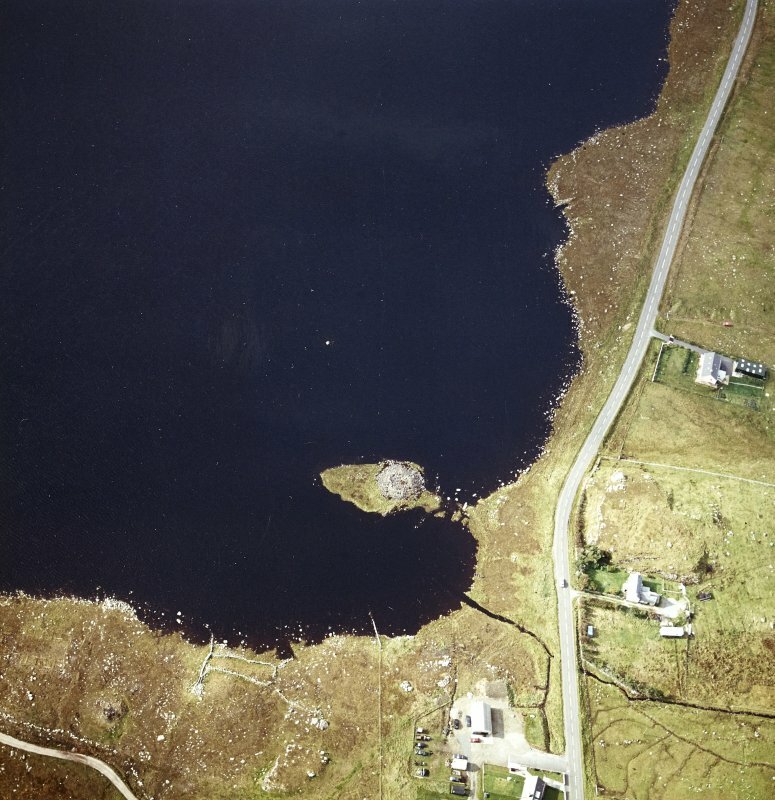 Oblique aerial view of the broch in Loch an Duna, taken from the ENE. Oblique aerial view centred on remains of the horizontal mills with the remains of the corn-drying kiln, broch and possible crannog adjacent, taken from the NNE. 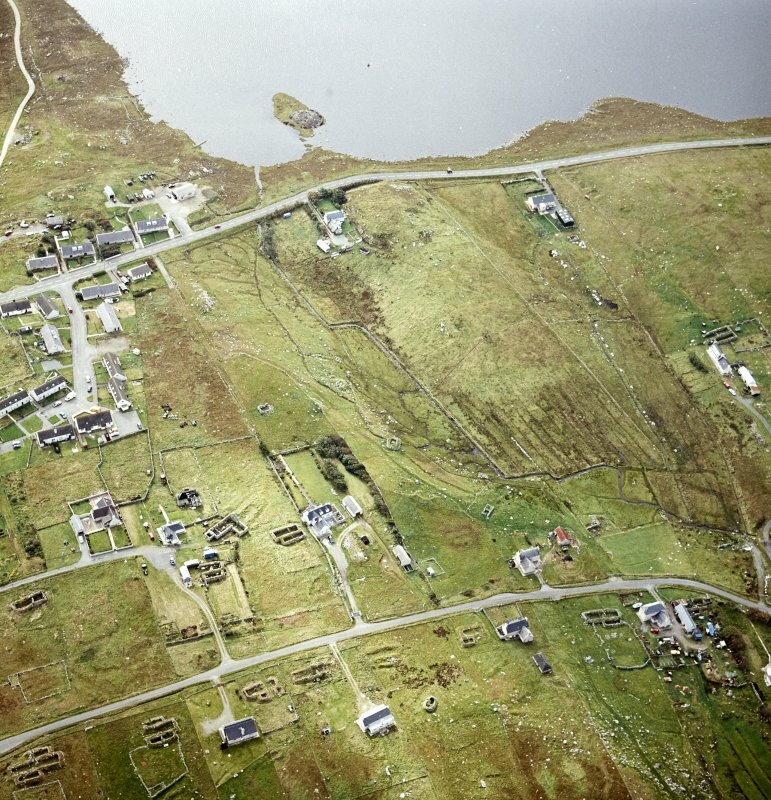 Oblique aerial view centred on remains of the broch with the possible crannog adjacent, taken from the NW. 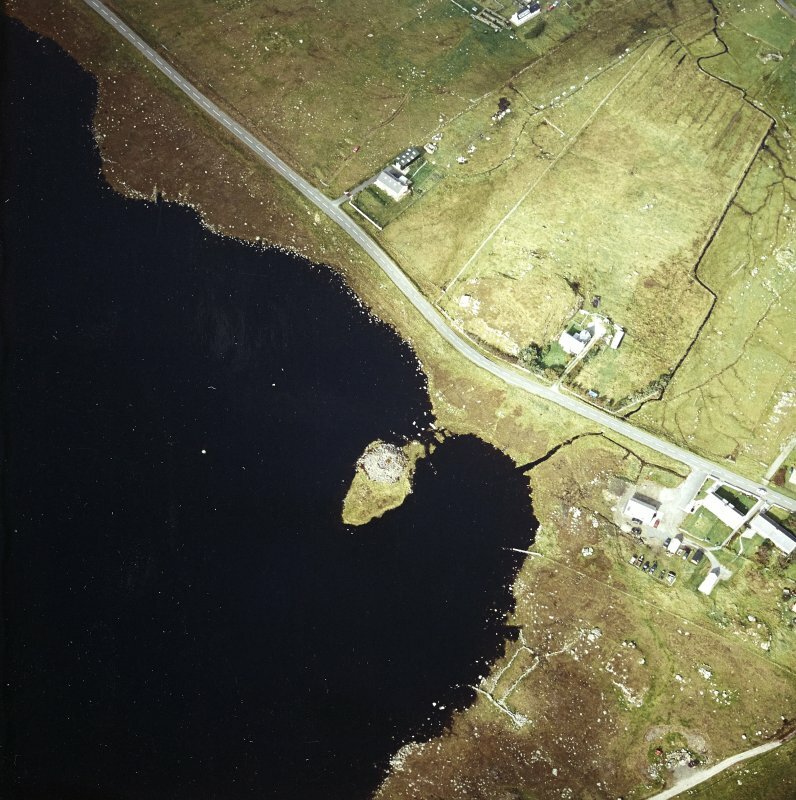 Oblique aerial view centred on remains of the broch with the possible crannog adjacent, taken from the SE. 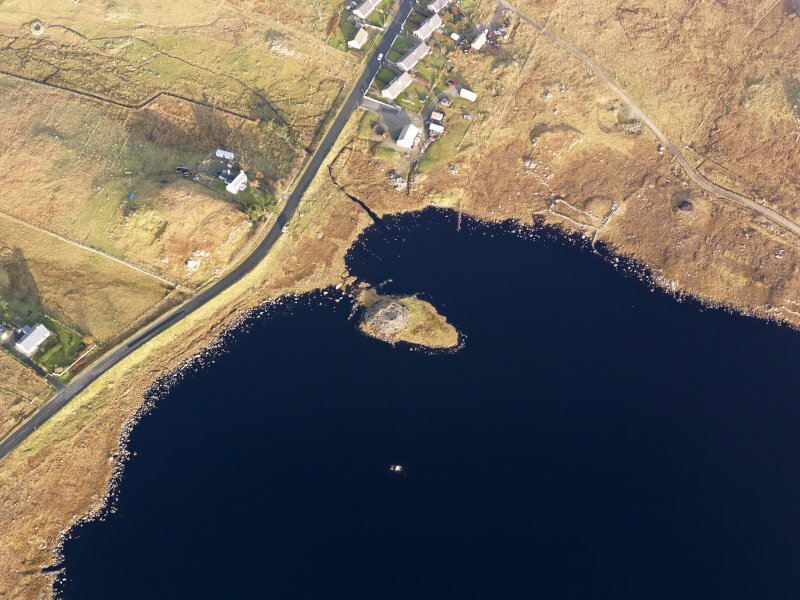 Oblique aerial view of the broch in Loch an Duna, taken from the SSE. 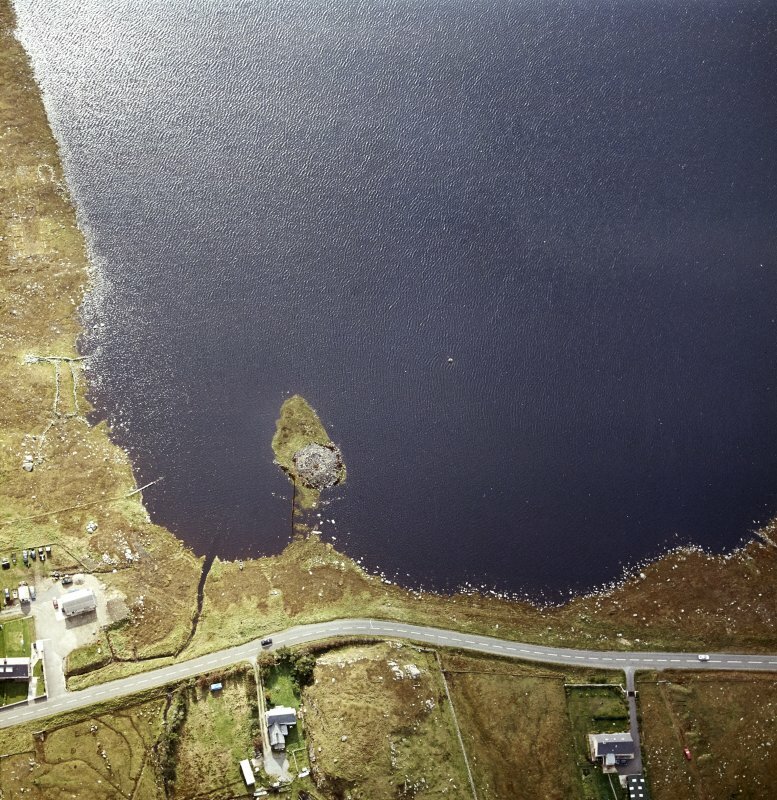 Oblique aerial view centred on remains of the broch with the possible crannog adjacent, taken from the ESE. 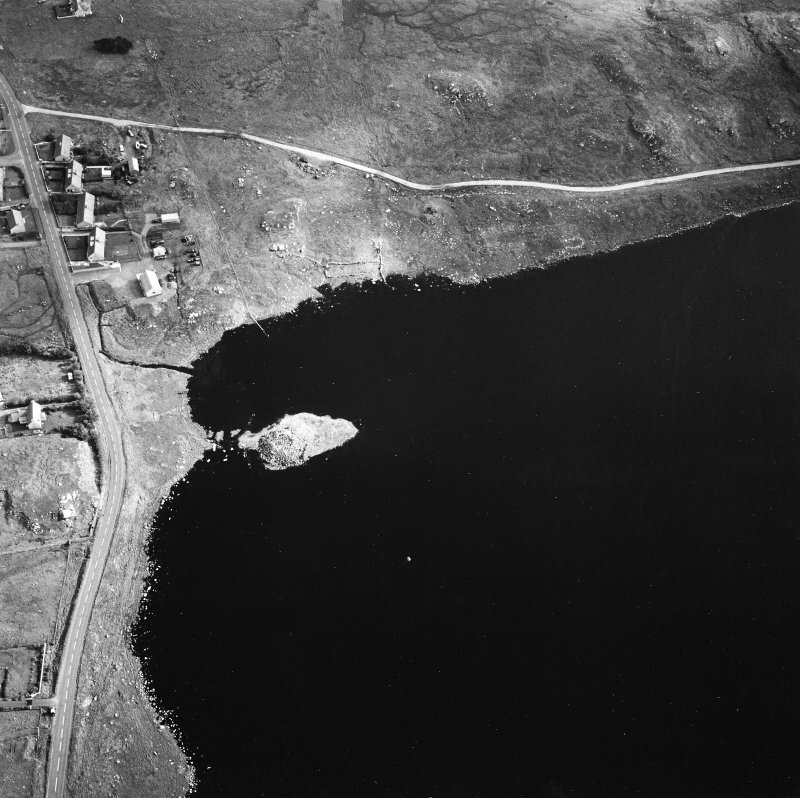 Oblique aerial view centred on remains of the broch with the possible crannog adjacent, taken from the W.
Oblique aerial view centred on remains of the broch with the possible crannog adjacent, taken from the ENE. 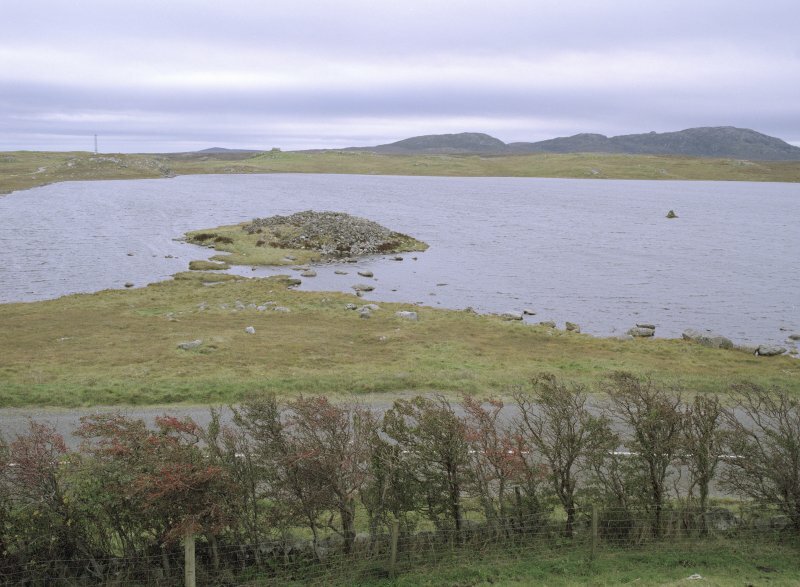 General view of Loch An Duna Broch taken from the north. Lewis, Loch An Duna. 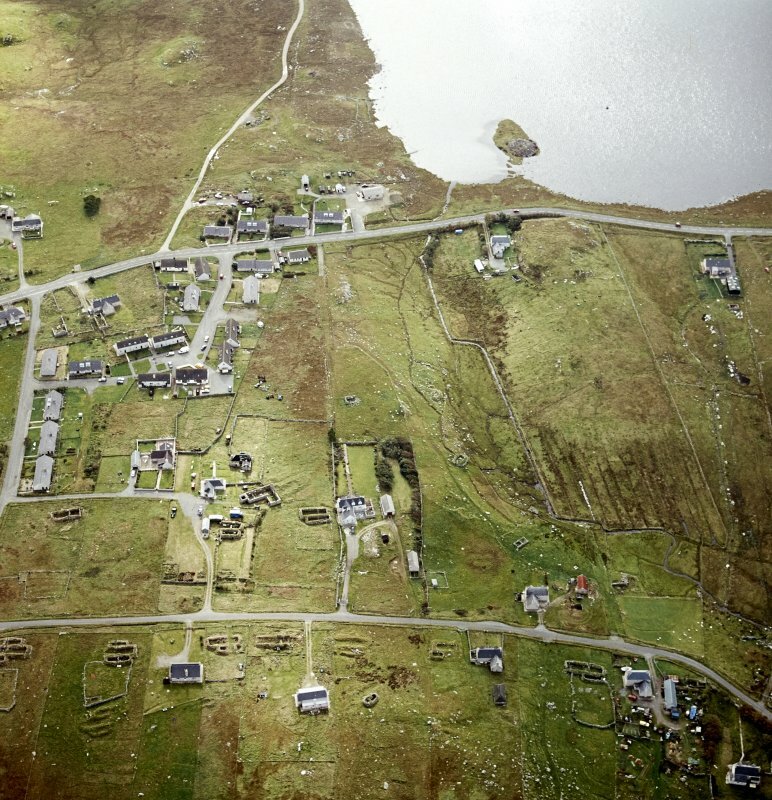 General view of broch. 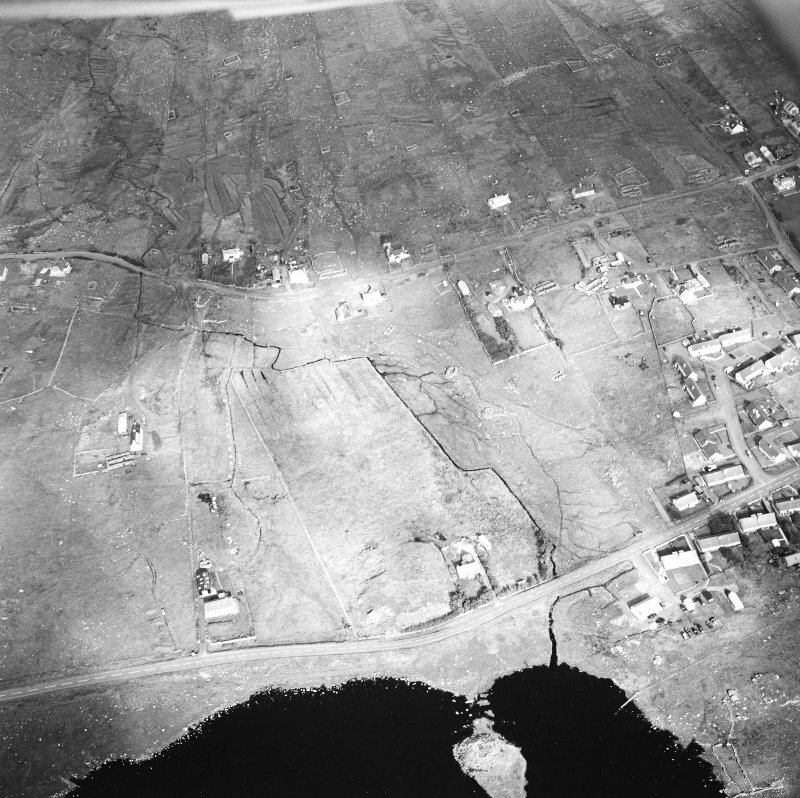 Oblique aerial view centred on remains of the horizontal mills with the remains of the broch adjacent, taken from the WSW. 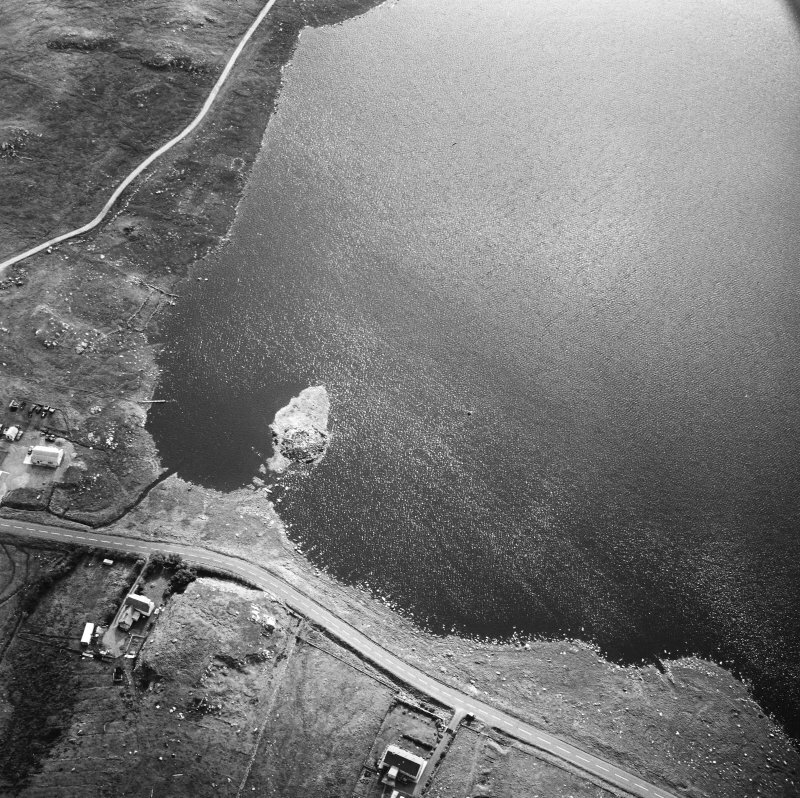 Oblique aerial view centred on remains of the broch with the possible crannog adjacent, taken from the N.
Detail of entrance into Bragar broch. Loch an Duna, later first millennium bc Ruin of islet broch tower with three separate crosswalls cutting off the causeway approach. It was described by George Atkinson in 1831 as 'having on its east side, a square opening about 3 ft high on a level with the ground, which runs in a straight line towards the centre of the building 7 or 8 ft, and then opens to the left, into an oven-like cavity, large enough to sleep in'. 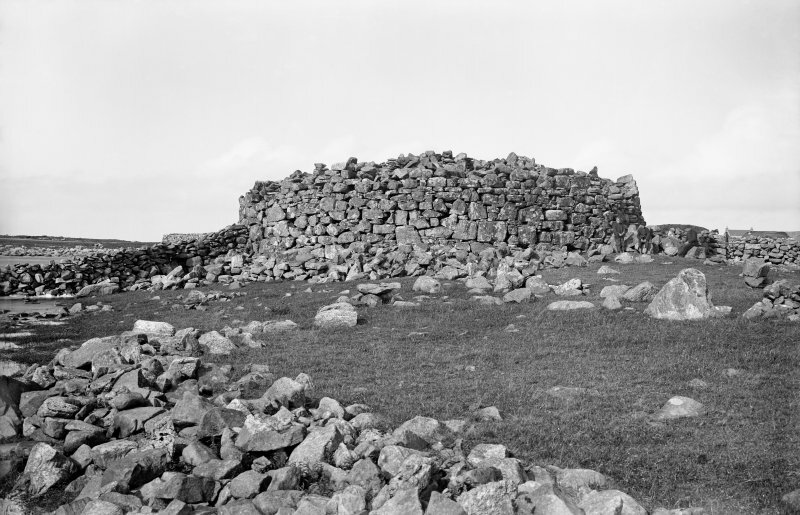 In the tradition of many Iron Age roundhouses in the Hebrides, it was apparently reoccupied in medieval times, or continued to be occupied up until the late medieval period. 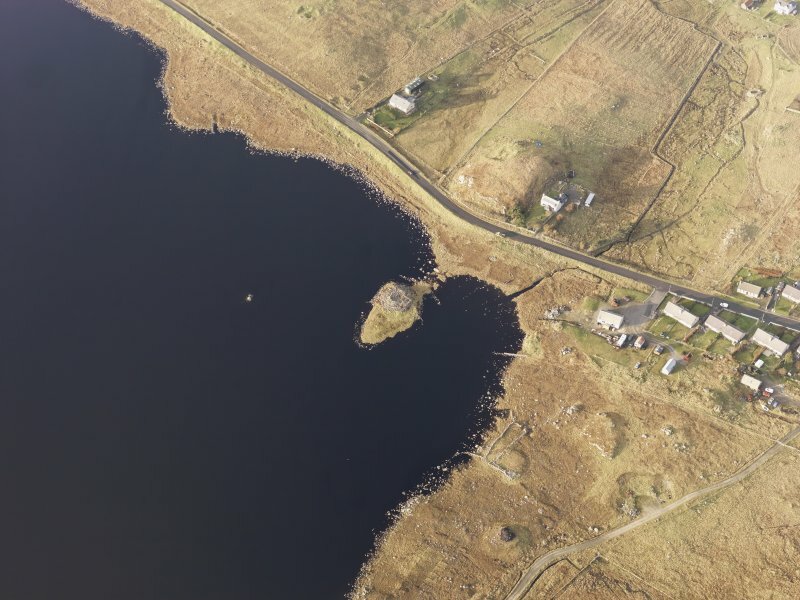 Dun Bhragaiur, Loch an Duna (F W L Thomas 1890) or Dun Loch an Duna is a broch (RCAHMS 1928), with an external diameter of 55ft and walls 12ft thick, standing to a height of 14ft on the S side (the wall showing a marked batter). This is alleged to be the place where John Roy Macphail (or John Mackay) was caught in bed in the 16/17th century. F W L Thomas 1890; RCAHMS 1928, visited 30 June 1921. 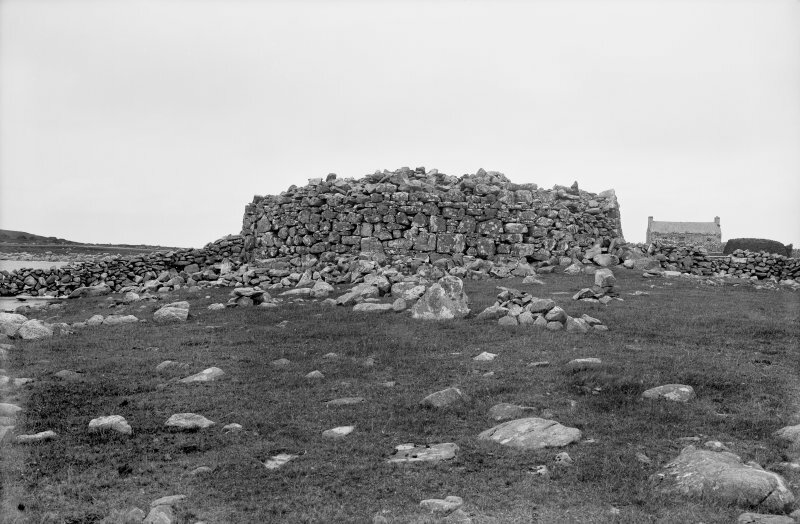 A broch, about 16.5m in diameter over walls about 3.5m thick, standing to about 3.0m maximum height, generally as described and planned. The tumbled remains of a wall can be seen across the neck of the promontory on which the broch stands, but it is uncertain whether this is contemporary. 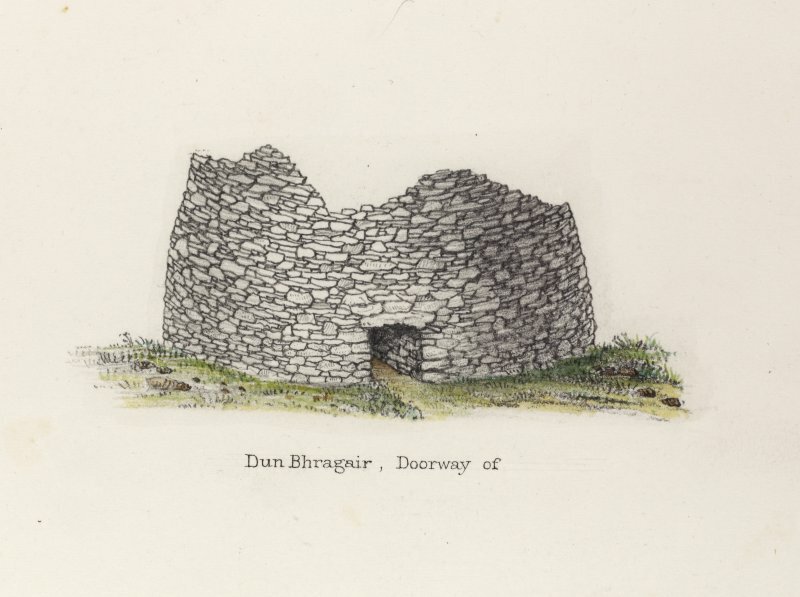 The broch is known locally simply as 'the dun'. Visited by OS (R L) 19 June 1969. A fragment of vitrified material was recovered from the outer wall of the broch in its northern arc. The area of burning is not extensive. 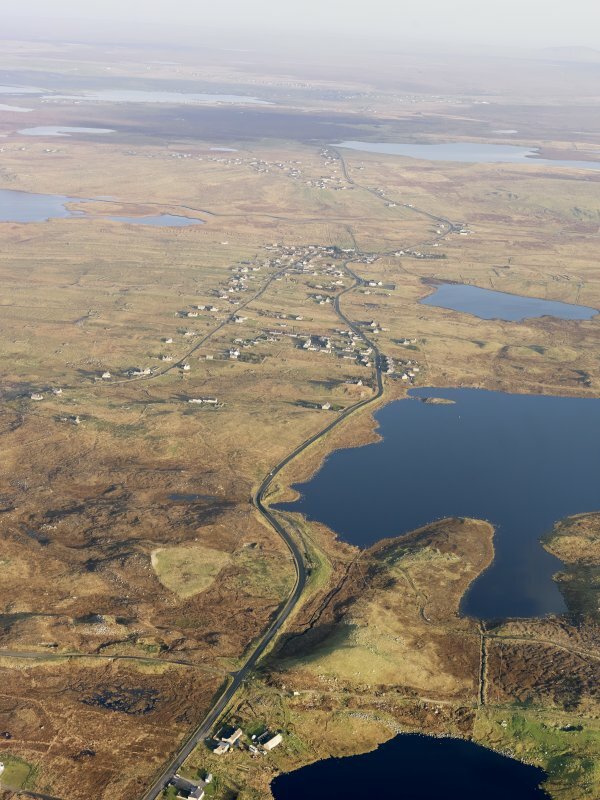 A small piece of the vitrified mass has been deposited at the Callanish Archaeological Research Centre'. I B M Ralston and P G Topping 1986. 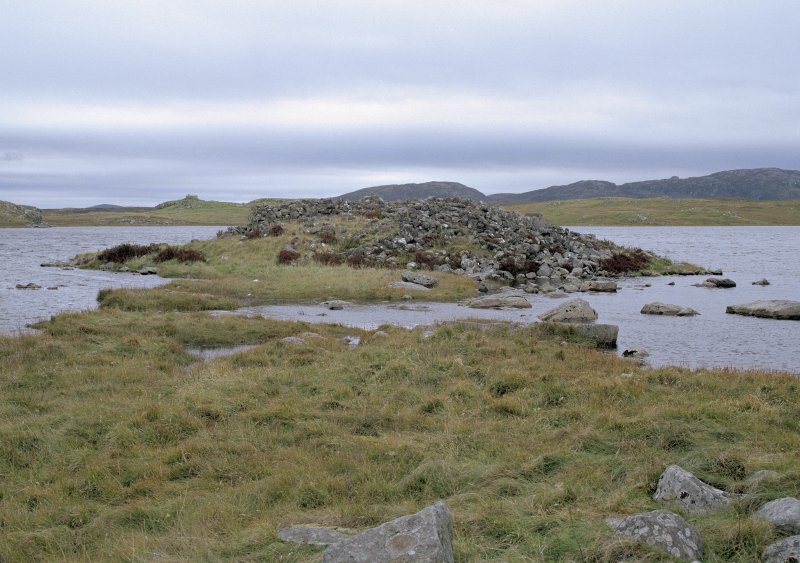 On the W shore of the islet are the remains of a possible causeway leading SW towards the possible crannog lying submerged about 60m away (NB24NE 56). 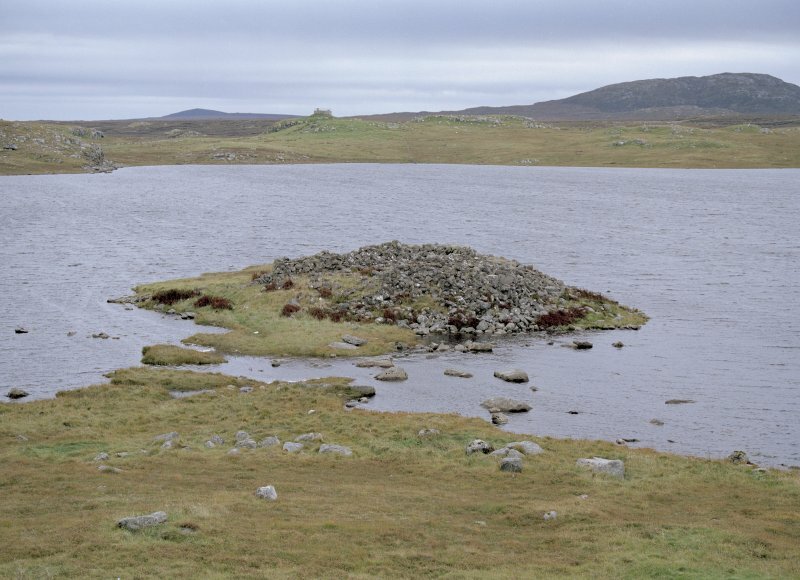 A similar relationship of submerged and visible remains in the same loch is recorded at Loch an Duin, Shader (NB35SE 4 and NB35SE 6 ). NB 2855 4740 Site identified as part of a desk-based assessment and walk-over survey. He adds that the further destruction of this dun had been stopped by Sir James Matheson. It is still an impressive heap of rubble but it is clear that a vast amount of stone has been removed from the site in the last one hundred and fifty years [4, fig. 33]. The Royal Commission’s 1921 plan is at first floor, or scarcement, level (Level 2). "This dun (Pl. XLVII) is situated near the road, on a small point projecting into the lake, about 1 mile from the bay, which has given this township its name. It was a cylindrical tower, of undressed stone, and without mortar. We examined and surveyed it with as much care as the encumbered area" (i.e. the central court) "and the ruined state of the walls would permit. The external diameter (ab) of the dun is 55 feet, and the walls are 12 feet thick. The present height of the dun on the south side is 14 feet, and the batter at that height is 2 1/4 feet; the internal area (cd) is 31 feet broad. The main doorway (e) is 2 3/4 feet wide and 3 1/2 feet high, and is of course 12 feet long. It is to be remarked that it faces the water, which shows some strategical forethought. When on an island the door usually faces the stepping stones. 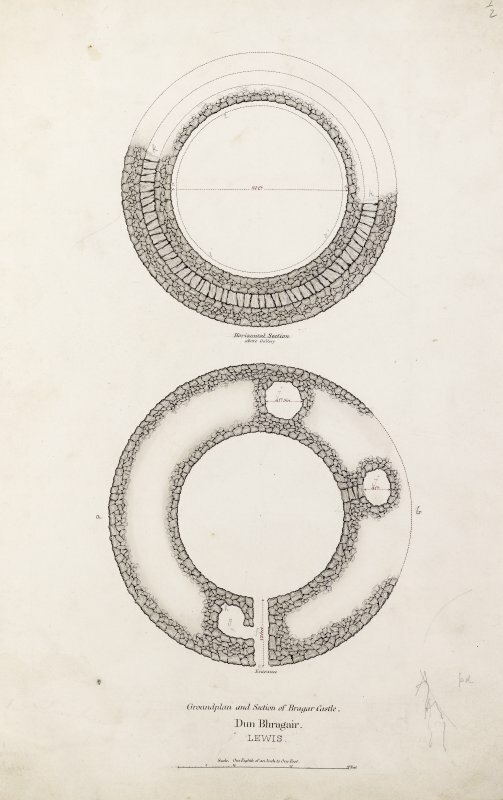 On the left hand side of the passage is an entrance (f), 2 1/4 feet wide, to a subcircular beehive guard cell (g), about 5 1/2 feet in diameter and 5 3/4 feet high; at the inner side is a small cuil or recess (h). Around the area, at a height of 7 1/4 feet from the ground, is a cornice or ledge (i), formed by projecting, flat, undressed stones, of from 3/4 to 1 foot broad. The area is filled up to the cornice with stones, which formed the wall of the tower; and I had neither time nor force enough to excavate sufficiently in search of the inner door. All we could be certain of was that there was a gallery (k)” (i.e. a Level 2 gallery) “through the wall for about one-half of its circumference; and there appeared to be the remains of beehive chambers in the walls, with their floors at different heights." Level 1: the broch is approximately circular and the outer wallface is visible most of the way round, standing several courses high. The main entrance is on the south-east, 73.5cm (2 ft 5 in) wide at the outer end; the passage is still completely lintelled and almost full of rubble. Thomas described it as 1.07m (3.5 ft) high but it is now filled with more debris; the inner corners can be seen, looking like distant door-checks, about 3.3m from the outer end. None of the earlier observers saw any signs in the main passage of the door-frame or the bar-holes, but in fact the left hand check – of the built and rebated type – is clearly visible 80cm from the outer end. 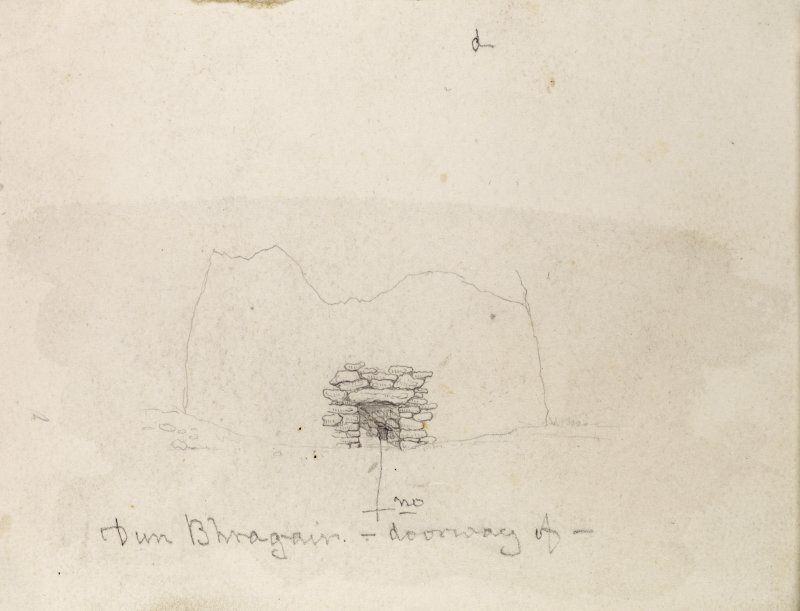 Thomas also saw a corbelled ('beehive') guard cell on the left of this passage, with a doorway 69cm (2.25 ft) wide leading into it and 1.68m (5 ft 6 in) from the exterior; the lintel of this doorway can be seen, as can a large dislodged lintel close by. There is apparently a small aumbry in the inner wall of the cell. The drawing shows the corbelled roof clearly. There seems to be another mural cell at 12.30 o'clock, and another doorway at 2.30 o'clock – one jamb of which can be seen – probably leads to the mural stair. Thomas shows it as leading to a cell, so he may have been able to trace the stair-foot guard cell at that time (unless the stair is at 12.30). Presumably most of the wall base is occupied by a ground level gallery. Level 2: in 1921 an upper gallery – evidently roofed in parts – could be seen running clockwise round the wallhead from about 2.30 o'clock on the north side, past the entrance to about 10 o'clock (on the west) . The aforementioned door jamb is shown on the plan as connecting with this gallery, suggesting that it is a raised void above the invisible Level 1 door. The gallery apparently also opened to the interior by way of the chamber over the entrance, which can no longer be seen [3, fig. 26]. 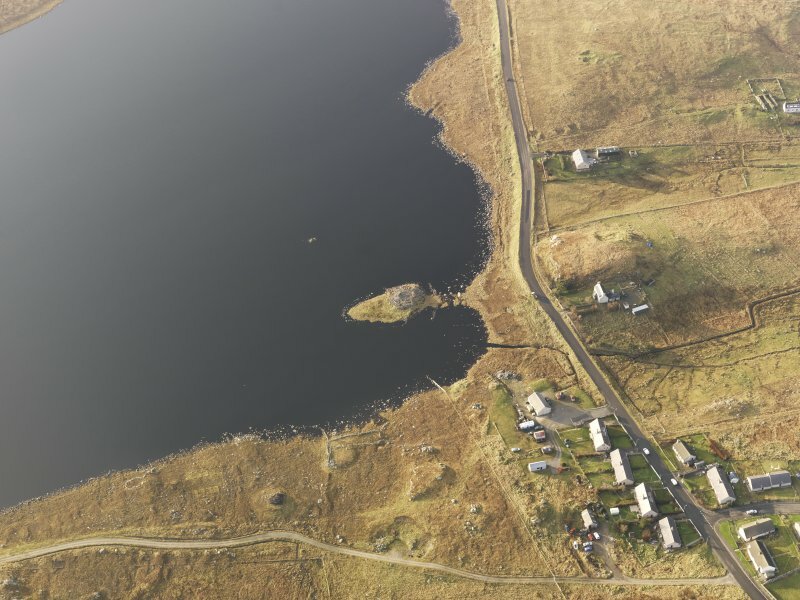 If the Commission's plan is correct Loch an Duna is another example of a broch with the cross-shaped arrangement above its entrance – that is the first floor gallery connects with the chamber over the entrance on both sides (see Beirgh – NB13 3 – and Dun Carloway – NB14 1). 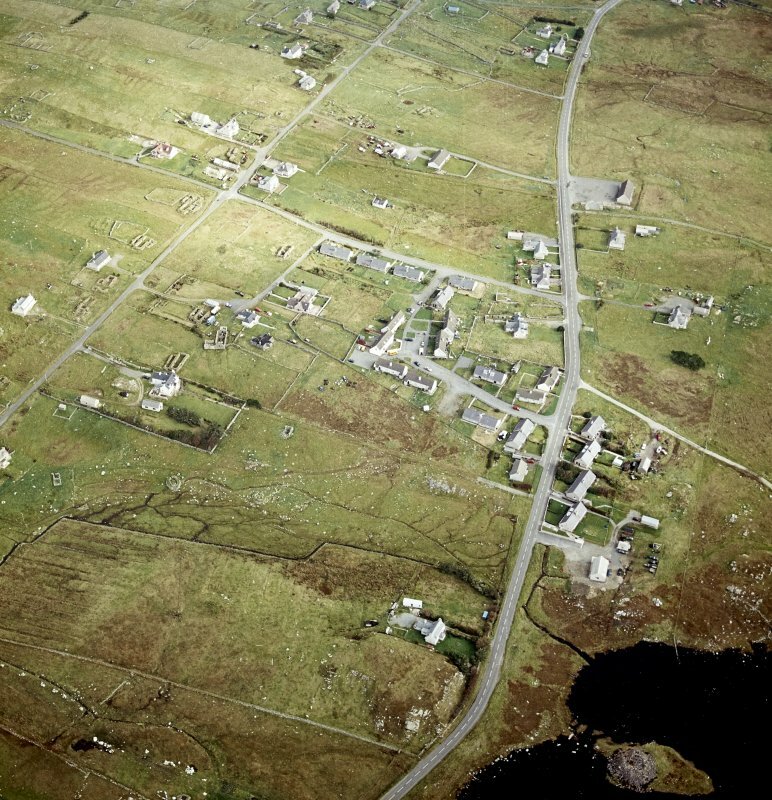 It is striking that three of the four known sites are all in Lewis and Harris and quite close to one another. Thomas' Level 1 plan and elevation shows half the circuit (with the entrance in the middle of it) of this upper gallery still lintelled over, and with a fragment of the Level 1I gallery showing higher up : “horizontal section above gallery”). The chamber over the entrance was therefore probably well preserved, though under rubble, at the time of his visit. A ledge scarcement runs round the inside wallface, 15-30cm (6-12 in) wide and 2.90m (9 ft 6 in) above the ground outside the entrance ; if this last figure is correct the ledge must be unusual in being well above the level of the innermost lintel of the entrance passage, since the outer lintel – presumably on the same level – is only about 1m above the ground. None of these features – scarcement, upper gallery and voids – are visible now. Judging from the stated height of the scarcement the ledge has been destroyed, as also has the chamber over the entrance. 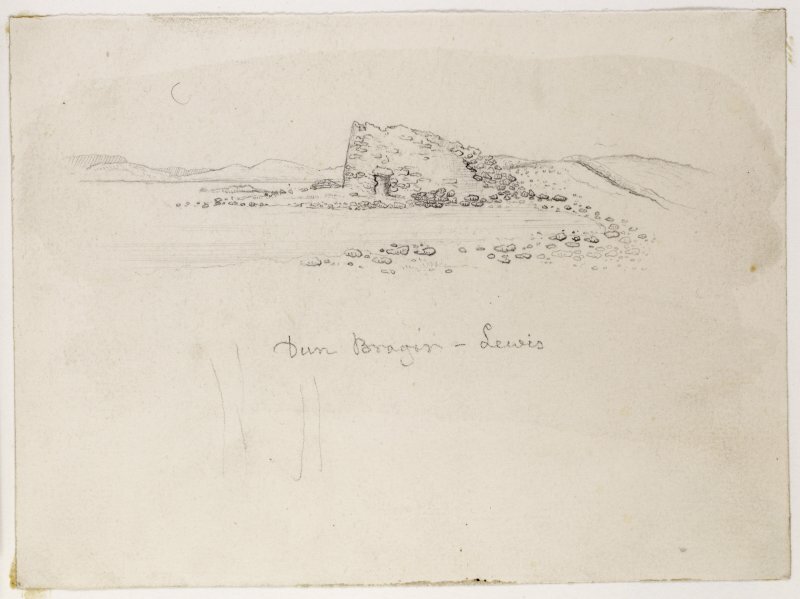 Thomas gives a censored version of a story about this broch, perhaps belonging to the early 17th century and recorded by “the industrious collector of the traditions of Lewis, John Morrison.” It concerns one John Macphail (or Mackay) who was possessed of enormous strength and who had helped in the treacherous seizure by the Morrisons of two Macaulay men who, though taken to Ullapool, escaped and returned to Lewis. An attack upon the Morrisons and Macphail being clearly imminent, he shut himself up with his wife, who was a Macaulay, inside Dun Bhragair. 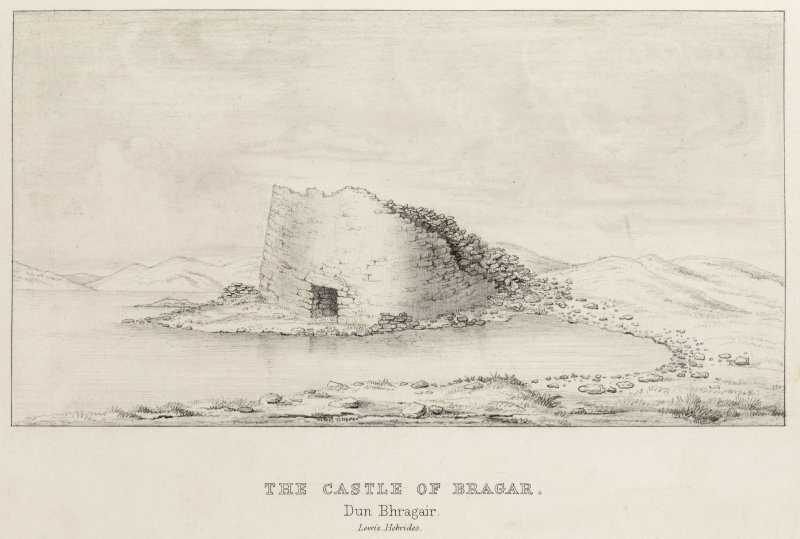 Twelve of the best Macaulay swordsmen were deputed to capture him and they managed to get into the broch in the night, finding Macphail in bed (see the legend about the climbing of Dun Carloway, NB14 1 above). However all twelve could not hold him down until his wife (whose lineage evidently meant more than her marriage vows) called out, asking “Did they not know how to hold a boar?”. Thus “by unfair means” were they able to make him prisoner, and they started for Uig next day with Macphail bound with rope and held by six men on each side. Even so he was able to hurl all of them unto the water when crossing the Grimasta River. However he was kept captive and later summarily put to death. There is some surface pottery from “Bragar” in the Beveridge Collection in the National Museums from Scotland which might be from this site, or from nearby. The three sherds illustrated include a fine Vaul ware vase which would suit the broch occupation but also two good examples of the bucket urn with an internal rim flange which could be very much earlier. Thomas gives the external diameter as 16.78m (55 ft) and the internal is inferred as 9.46m (31 ft) , the wall being 3.66m (12 ft) thick . 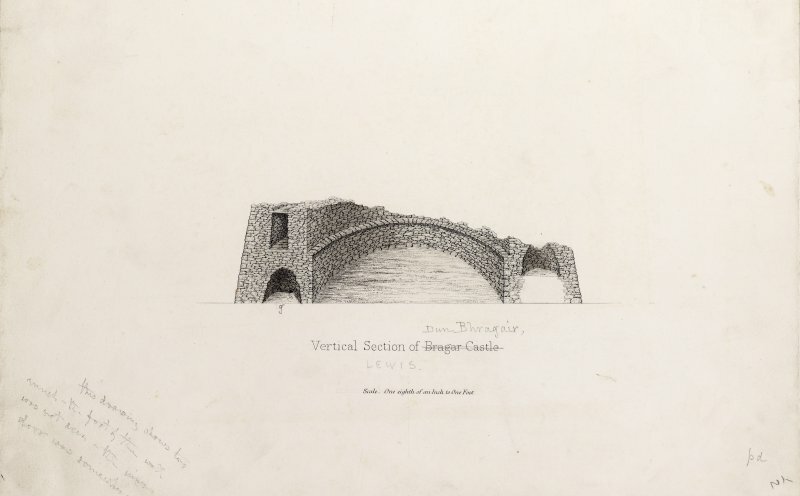 More recent dimensions are – internal diameter 9.15m (30 ft) and the wall from 3.05 - 3.66m (10-12 ft) thick, giving an external diameter of about 15.86m (52 ft) ; in this case the wall proportion is about 42.3 %. Most recently the diameter has been given as 16.5m and the wall thickness as about 5m . Sources: 1. NMRS site no. NB 24 NE 2: 2. New Statistical Account (1837): 3. Thomas 1890, 374-6 and pl. xlvii: 4. RCAHMS 1928, 5, no. 10 and figs. 26 and 33: 5. Feachem 1963, 165: 6. Ralston and Topping 1986, 50: 7. Ritchie and Harman 1996, 125.